I spent the day catching up on a week or more of newspapers. While I'm reading, I always think about what might be interesting (or shocking!) to you, but by the time I finish reading, I'm so depressed and I don't want to depress you, too, so I usually don't write about it. There was one article from yesterday's La Prensa that really shook me up, even though there are terrible stories like this every single day. I guess because a North American was involved it hit closer to home. A 39-year-old U.S. veteran in Comayagua, (a medium-sized town in Central Honduras) closed and locked his restaurant doors a little after midnight on Monday but left the parking lot gate open since he still had several customers inside, some doctors and some Americans, as well as two waiters. Three men came to the door a little later and were told that the restaurant was closed. One of the men became enraged, returned to his car where he retrieved a 9-mm pistol and a hammer. Witnesses told reporters that the men were drunk and that he proceeded to break in the door with the hammer, saying that he was a "high commander of the police and no son of a b*tch is going to close a business from me." He shot at the American, who hid behind the bar for safety and apparently shot back (but that part is not clear from the article). Seeing the commissioner shot, one of the three men, a relative of the police commissioner, jumped up on the bar and shot at the American. Both the American and the police commissioner, who was the Inspector General and Director of Transit of the National Police, were killed. The American died after receiving 17 bullets and having his head smashed in with the hammer. 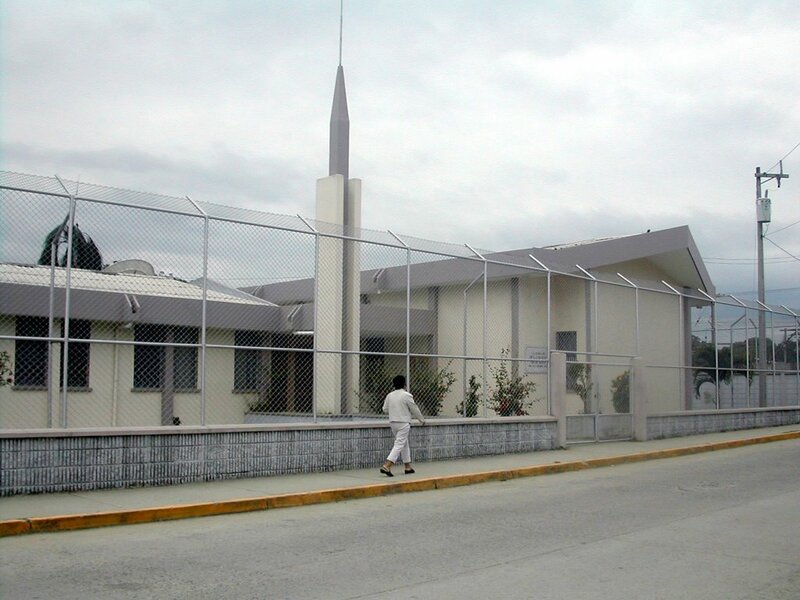 A witness, sister-in-law of the American, stated that she suspected that the aggressor was truly a police officer because when the police arrived they carried him out to the patrol car and left to take him to the hospital. They did not enter the premises for investigation nor speak with any of the several witnesses. One newspaper reported that the two other men, both relatives of the commissioner, were detained to hear their side of the story. Two newspapers did report that the police found cocaine, presumably in the police officer's vehicle. El Tiempo reported today that the sister-in-law has since received two death threats for speaking to the media about this event. She told the newspapers that she has no enemies so that if anything happens to her, it will be because of this. Even though the American had lived in Honduras for 18 years, was married to a Honduran and had children in Honduras, the headline read, "Gringo y comisionado de policía se matan a balazos" (Gringo and police comissioner died from gunshots). As is always done in La Prensa, the dead, mutilated bodies were shown in a quarter page photo. As is normal in Honduras, no mention was made in today's paper and that is probably the last we will hear about the issue. 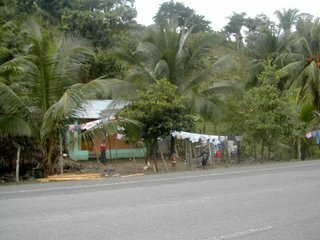 The police will declare it an ajuste de cuentas (roughly: settlement of scores) which means they were both at fault and no further action will be taken, even though it seems pretty obvious that the second man must have shot and beat the American to death after the commissioner was hit with a bullet. No comments were reported from the U.S. Embassy. 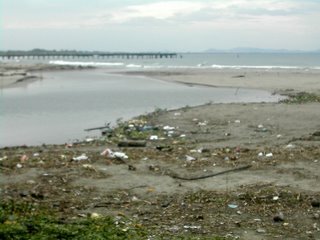 I'm sorry to say that after the mountains, the first thing I noticed when I saw La Ceiba six years ago was the trash, the next thing was the electrical wiring, but that is another story. 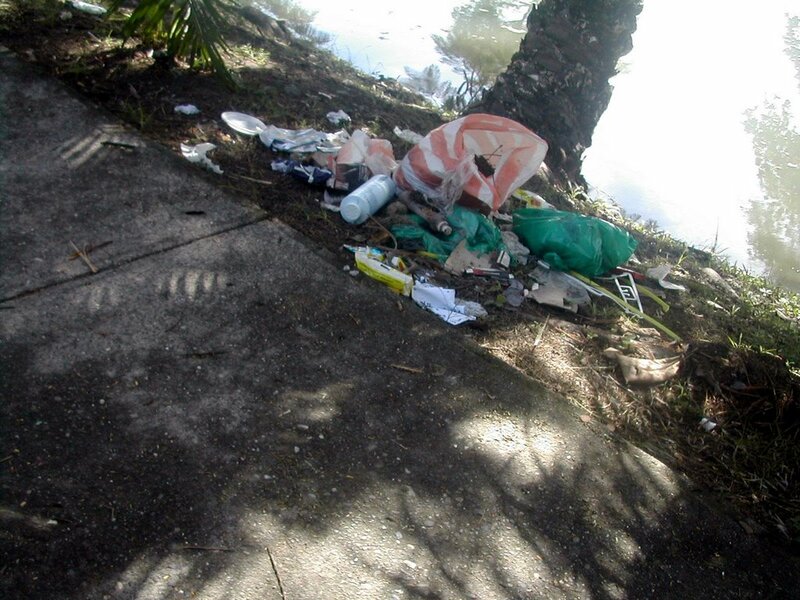 There is trash everywhere − it is even worse out in the country than it is in the towns. 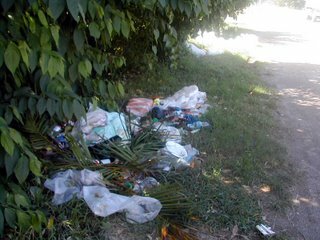 It is hard to find a tourist travelogue that doesn't mention how dirty La Ceiba is, even those tourists who have traveled to other Central American countries comment on it. Having grown up learning what a sin it is to litter, I couldn't help but be shocked by what I saw. My first trip to La Ceiba was in a taxi from the airport after dark. All along the edges of the highway, there were burning piles of trash. I was scared! I thought it was some sort of protest and that I had come to a war zone for vacation! In fairness to many Honduran people, trash pickup service, trash cans, and recycling bins are scarce to non-existent. Some people just can't afford to pay for pickup service even if it is available, which it mostly isn't outside of the larger towns. 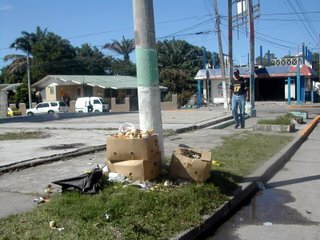 In La Ceiba and San Pedro Sula, the trash collectors are the first to go unpaid when the municipalidades (city governments) run out of money − so of course they stop picking up the trash. Why would they when they aren't being paid? 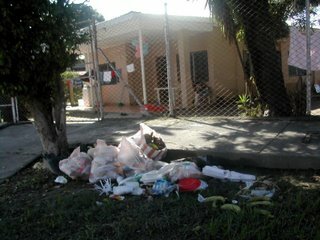 People have to pay a fee to take trash to the La Ceiba city dump, so many of them just dump their trash on an out of the way street or empty lot, even in the nicer neighborhoods. Once I was on our upstairs terraza and I saw our new maid carrying a bag of trash from the house out towards the hill in our backyard. I yelled, "Nooooo!" but it was too late as I saw her fling the bag towards the creek into the lower level of our own backyard! I've read that in many places in Mexico, you have to be outside to personally hand your trash bag to the collectors. While inconvenient for the residents, I'm sure it does a lot to prevent litter. Here in La Ceiba, many homes have these types of trash receptacles which help to prevent the starving dogs from making a mess of the trash but don't do much to prevent cats, rats, or birds or the starving people who tear open the trash bags looking for something to eat. Out in the country there is generally no pickup service at all, so people dump their trash wherever it's convenient, maybe a town dump, maybe the street, maybe the river, or maybe just in their backyard where they burn it. 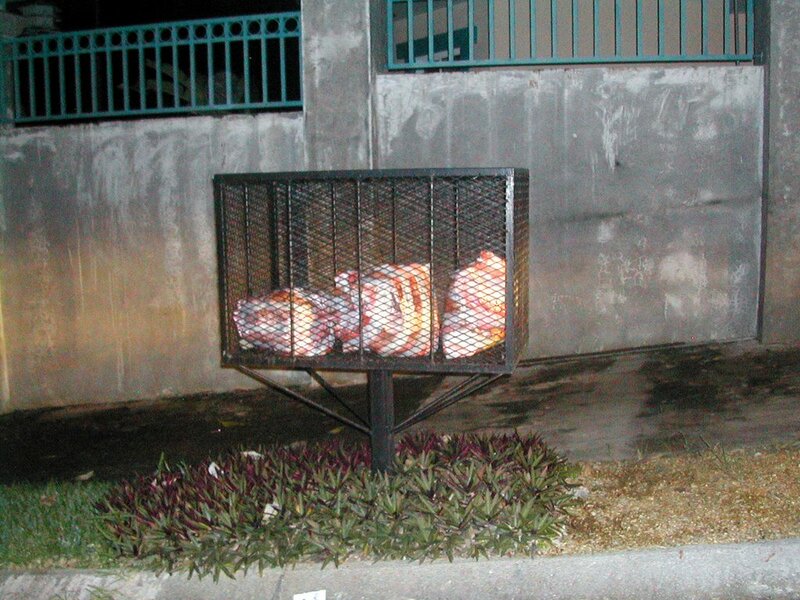 The smell of burning plastic can be overwhelming in some colonias. I've read that burning plastic can cause permanent brain damage, especially to children. As a former recycling advocate in Dallas, when I first moved here I just cringed every time I threw a plastic bottle or metal can in the trash, but there didn't seem to be anything else to do. A year ago I read in the paper about a plastic recycling company in a nearby town, so I immediately started rinsing and saving all of our plastic refuse. We never were able to find this company, but we've since learned that the trash collectors, as a side line business to make extra money, go through all the trash and pull out the recyclables to sell. Apparently they know where to take the things. I imagine that they are thrilled to find my nicely rinsed, separately bagged plastic and cans. I hope they can make a few lempiras from it. It is a custom for passengers to eat and drink on buses. Buses have signs saying "Don't leave your trash on the bus" but almost never provide any kind of trash receptacle because they would have to pay a couple of lempiras for a bag. 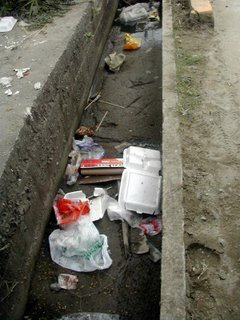 As a result, the trash is thrown out the windows and litter lines every street and highway wherever you go in Honduras. Ninety percent of the litter is plastic so it isn't going away. 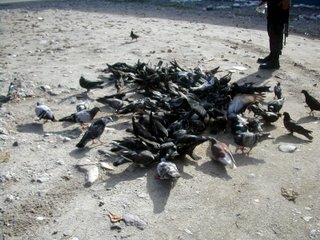 Luckily, Honduras has a huge population of vultures in the country and pigeons in the cities, so that takes care of the food and dead animal waste or this would probably be a country with a cholera or plague epidemic. 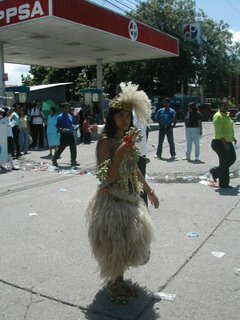 La Ceiba has a Gran Carnaval every year in May. It's one of the only times of year that the nicer hotels fill up with tourists. 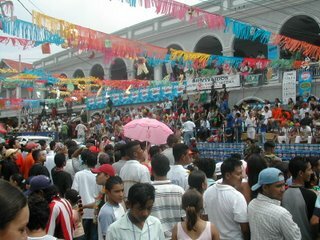 There is a big afternoon parade with decorated floats, several street bands in the evening, and lots of people selling food and other junk in the streets for a week or two before and a few days after the carnival. In honor of the occasion, a day or so before the parade, the municipalidad (city government) hauls out a hundred or so 55-gallon trash barrels and places them along Avenida San Isidro, the main street. These barrels are in no way sufficient for the amount of trash accumulated by the thousands of people eating and drinking in the streets all day and all night long. 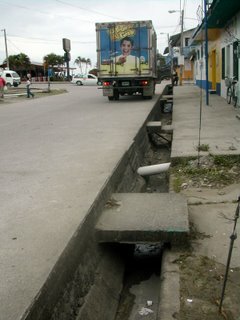 The cans fill up by 7 p.m. or earlier and the rest of the trash and excess food is discarded in las calles (the streets). When I go to carnaval, I usually want to throw away my shoes when I get home. Actually, it is mostly the tourists who use the trash cans. Ceibeños are notorious for throwing their basura (trash) in the streets, carnival or no. Occasionally the schools make their students go out on Saturdays to pick up trash as a community service. 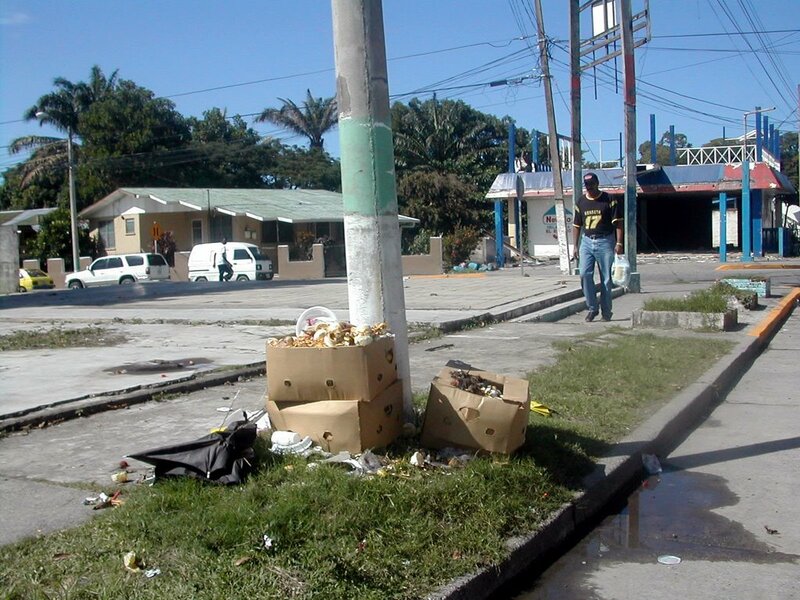 Even the municipalidad sometimes will force the city employees to do a clean up campaign. The effects last maybe a day or two. 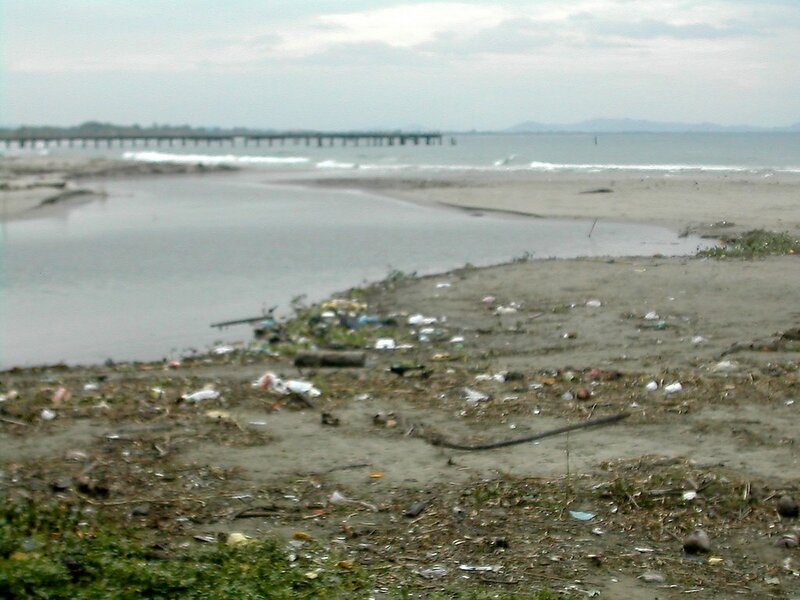 The city of La Ceiba is prone to frequent and severe flooding, a direct result of the sewer system being filled with plastic soft drink bottles and plastic bags. Even an hour of tropical rains can cause many of the streets to flood. City spokesmen always tell the media that the "flooding is caused by ignorant people who stop up the drainage lines with trash." Despite the city's interest in these litter campaigns, as soon as Carnaval is over, the basureros (trash cans) are picked up and taken to − I don't know − a trash can storage vault? This is done so that the cans will be tucked away safely until next year and the next carnaval. The very few business that do maintain a trash can outside their establishments generally have them secured to a light post with a heavy-duty chain. People steal them if they are left out. I have walked blocks around town with a can or plastic bottle in my hand looking for a trash can. I have had the experience many times of going into a store to shop or a restaurant to eat and asking if they had a trash can where I could dispose of it and having them tell me "no!" So, is it any wonder that people throw their trash on the street? In all fairness, what would you do with your mountains of trash day after day, year after year, if it wasn't being picked up and you didn't have a car to take it somewhere? Like most of the problems in Honduras, I place the blame on the government and the lack of education. Sanitation service is something that should be provided by government. In fact, the sanitation charge is 31% of our total property tax bill. I have lots of ideas, like recycling, teaching composting, requiring buses to carry a trash bag (but allowing them to take the bags to the dump for free), and what I think is a really great idea about those precious city trash cans. But I know no one would listen to a gringa. 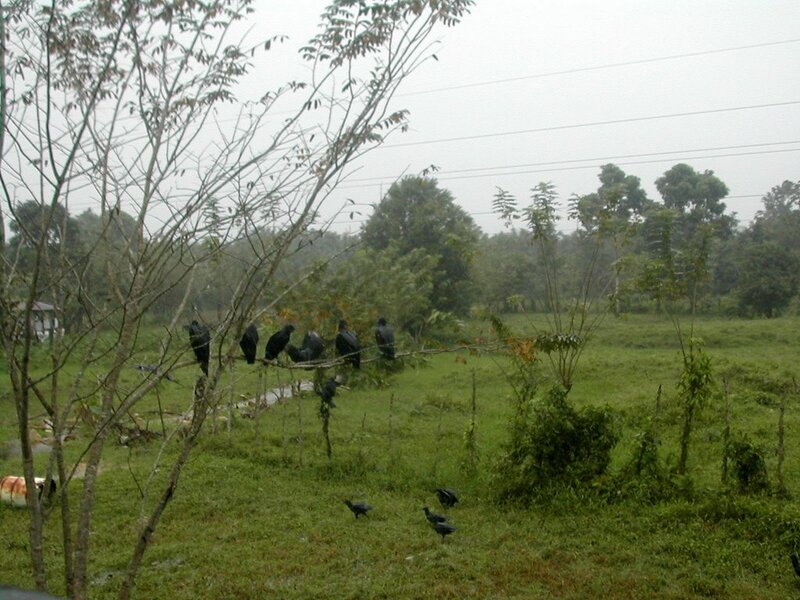 The standard answer for any suggestion (for improvement, not Americanization) is, "Well, this is Honduras. This is the way we do things," or "We don't have money for that." My idea about the trash cans is this: Get local businesses (certainly hotels and restaurants have a vested interest in improving the appearance of the city) and the "elite" to donate trash cans and paint or use some of that 4% tourist tax. 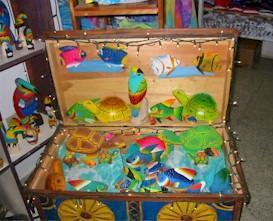 Take the old and new cans and paint to the local schools and have the kids decorate them. Have a contest with prizes for the kids and/or schools with the best trash cans. 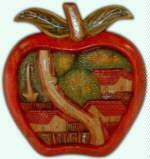 Have an show displaying the artwork and then display them proudly on every street corner in El Centro. 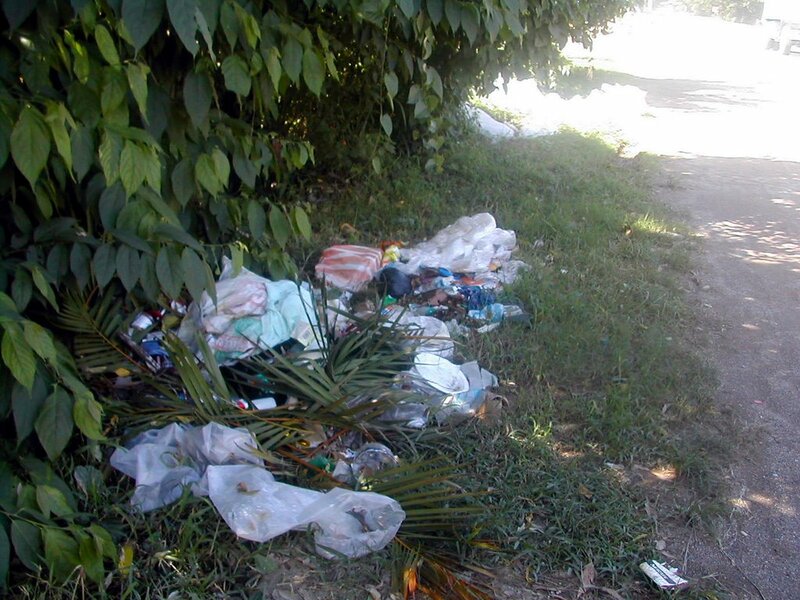 Simultaneously, have a real litter/civic pride campaign, something like "Make Ceiba beautiful." It seems to me that highly decorated trash cans would not be so likely to be stolen since it would be so obvious where they came from. And the novelty of a brightly painted can just might cause more people to use them. I thought it was a brilliant idea, but since this is Honduras, most people would be hesitant to donate because probably whoever was in charge of the program would steal the money and paint. There is hope for a change in this country, because children are now learning in schools about the damage done by litter and about recycling. But it is going to be a long, uphill battle to change the culture of "it's not my problem" or "everyone does it so what difference will it make if I don't." 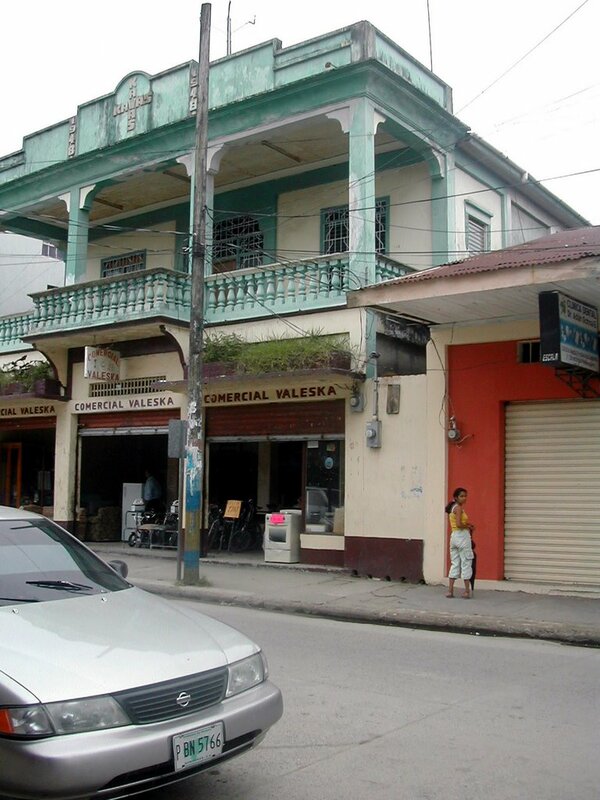 Tela, Honduras is described as a sleepy coastal town by its Chamber of Commerce. 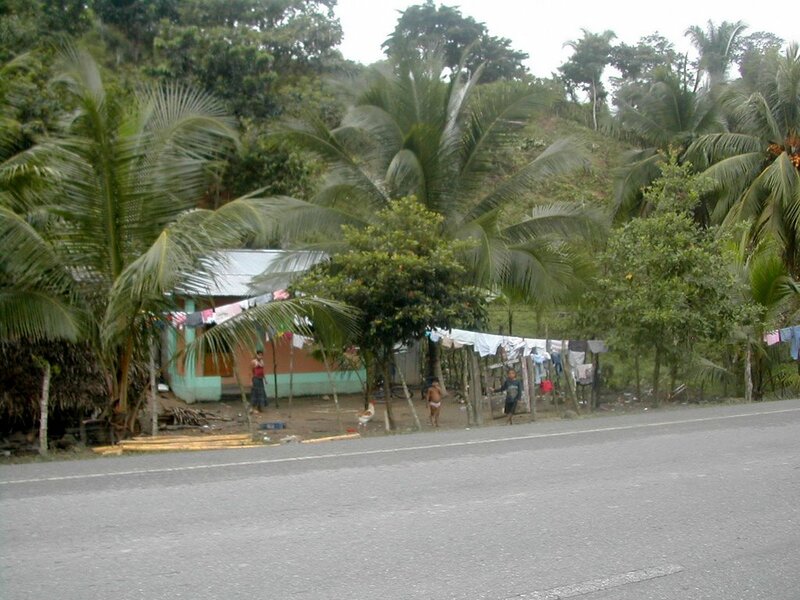 It is located on the north shore of Honduras, a little more than an hour's drive from La Ceiba. 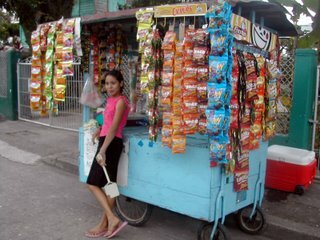 When we first arrived, there were an incredible number of street vendors running up to us to sell their pan de coco (coconut bread), Chiclets (gum), rope hammocks, CD's, and other items. 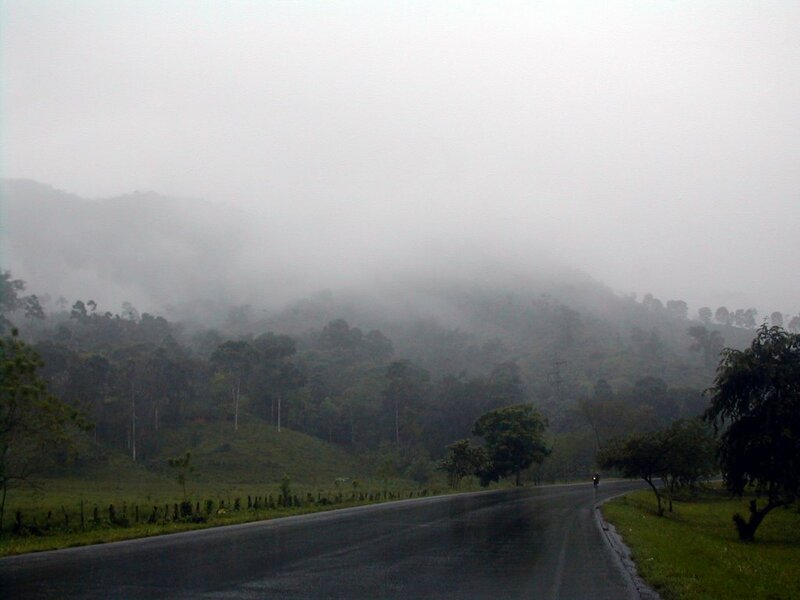 We were a bit surprised because we don't see this as much in La Ceiba. 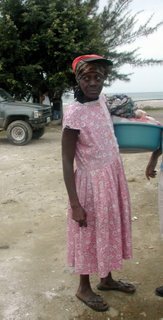 We bought some pan de coco (which sounds exciting but tastes like packaged brown and serve rolls) from this Garífuna lady. She carries this big tub of bread and tableta (coconut candies) on her head but wouldn't put it on for the picture. I've seen women carry tubs twice this size on their head, handsfree. I don't know how they do it. We spent a little time at two viveros (plant nurseries) and then walked around town for awhile. We didn't spend a lot of time because the main point of our visit to Tela was to meet a fellow blogger who was vacationing with his family who lives in Tegucigalpa (Tay-goo-see-gaul-pah, the capital city). We had such a wonderful time with "Don Godo" and his lovely wife and children. His wife is Honduran and has lived many years in the USA before returning to Honduras. We talked nonstop for six hours and I could have gone on for many more but we had to head back to tend to the chickens and dogs! Tela is much smaller than La Ceiba and our immediate impression was that is was somewhat cleaner, quieter, and smelled better. Apparently Tela has a centralized bus depot; we didn't see a single bus while we were walking around town. That and fewer taxis seemed to make a big improvement in the noise and air pollution. It also made it much more pleasant to walk around town. 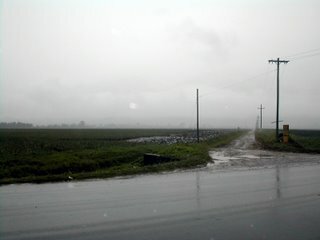 The first thing we noticed was the storm ditches! I don't know if they are in the midst of doing some repairs or if they plan to leave the streets like this. It is so incredibly dangerous for the vehicles as well as the pedestrians, I just couldn't believe it. We didn't remember it being this way the last time we were here. And of course, the ditches become the trash receptacles of the city. This made such an impression on me that, strange as it is going to sound, the next night I actually dreamed that I was driving and my tires kept falling into the ditches. This wooden stall is typical of street vendors in all the Honduran cities. The vendors aren't usually so cute, though. These little packages of chips and snacks range from L.1 to about L.3 each (U.S. 5 to 16 cents). It takes a long day to make a living at this. This building looked interesting. It's not as old as it looks. The sign on top shows the building name, "Kawas 1948." 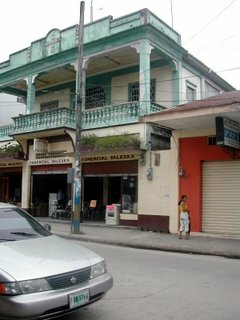 Middle eastern immigrants during the banana boom of the early 1900's, the Kawas family now owns many businesses all along the north coast of Honduras, as do many other wealthy middle eastern immigrant families. 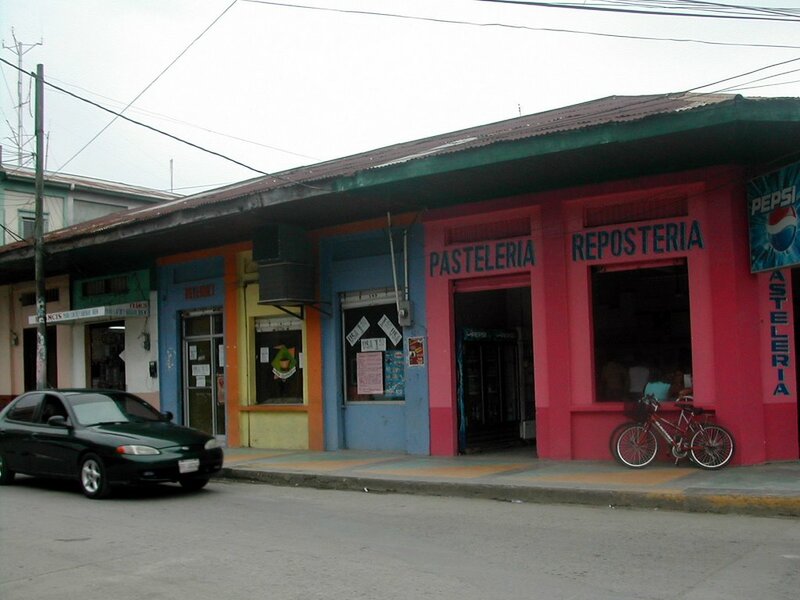 This building is more typical of the buildings in Tela, but it is more colorful than most. It houses a bakery, an internet cafe, and a couple of other small tiendas (stores). It is a sad state of affairs when a church right in the middle of town has to have a 15 foot fence topped with barbed wire. 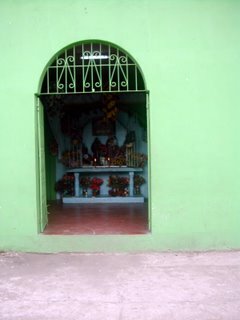 There are churches fenced like this in La Ceiba, too. I guess I'm being naive but I sure wish they didn't have to do this. Later we walked by this building, which looked like a house with the door open. People don't usally leave their doors open so I just had to look in. It was some sort of chapel and even though there were lots of things inside which could have been stolen, the door was wide open and it seemed to be unattended. It looks much more welcoming, doesn't it? Farmers (or maybe middle men?) 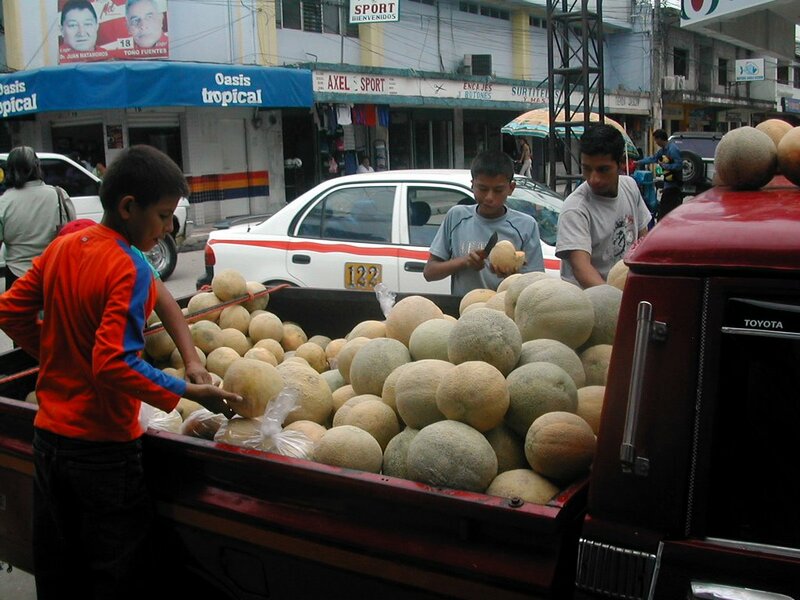 often sell their fruits or vegetables out of a truck bed on the street. These melons looked good, but we would have had to leave them in the car for hours and I wasn't relishing the thought of that smell in the car for the drive home. Here's part of the beach in the tourist mecca of Tela. Not all of the beach looked this bad, but it certainly gives a bad impression for a town trying to attract tourists. We stopped at a little comedor (restaurant) for a Coke and this was our view from the terrace. The following pictures are from the public market. 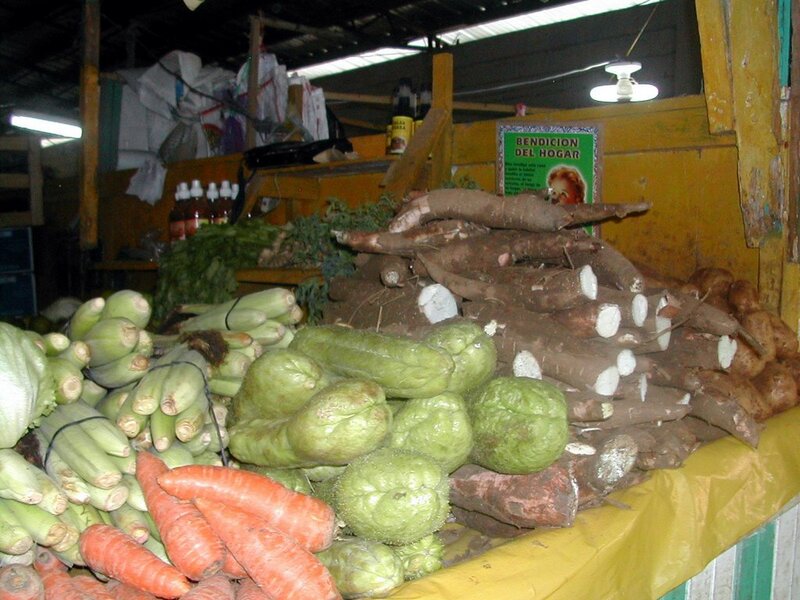 Tela has an indoor and outdoor market. 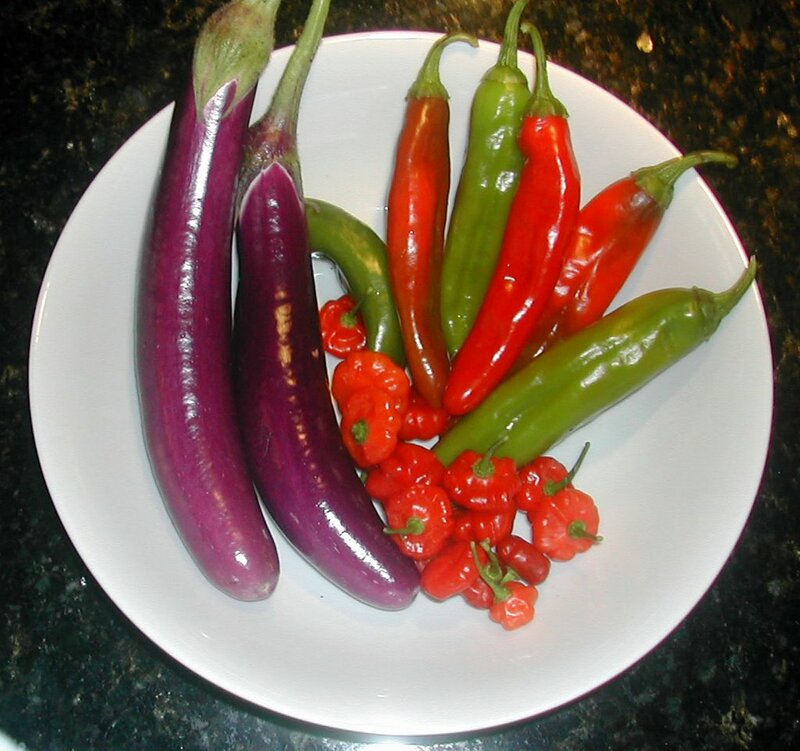 I was shocked to see that one vendor was selling the same Ping Tung long eggplant that I grow. It's the first time I've seen it here in Honduras. 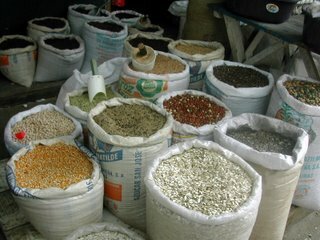 The first picture shows beans, dried corn, lentils, etc. 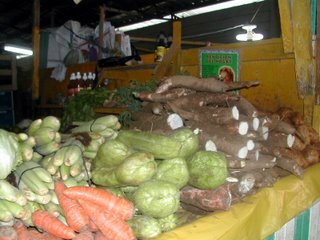 The second shows some of the most common vegetables: from left to right, repollo (cabbage), elotes (baby corn), zanahorias (carrots), patastillo (chayote squash), and yuca (Manihot esculenta, common name Cassava or yuca root). A serving of vegetables (other than raw cabbage or starches like bananas, plantains, potatos or yuca) with a meal is very, very rare, but if you get one, it's 100% guaranteed that it will be mixed vegetables, consisting of carrots, patastillo, onion, and possibly baby corn. The brown blocks above are aptly called 'dulce' (sweet). They are made from sugar cane and have an extremely sweet, kind of brown sugar flavor. 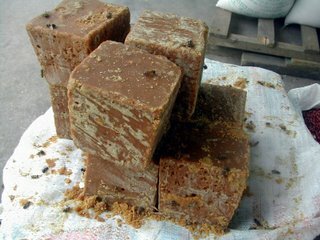 Dulce is melted and sometimes combined with other ingredients to make candies, frostings, and sauces. Those are bees all over the blocks and dead ones on the cloth below, apparently overdosed on the sugar. 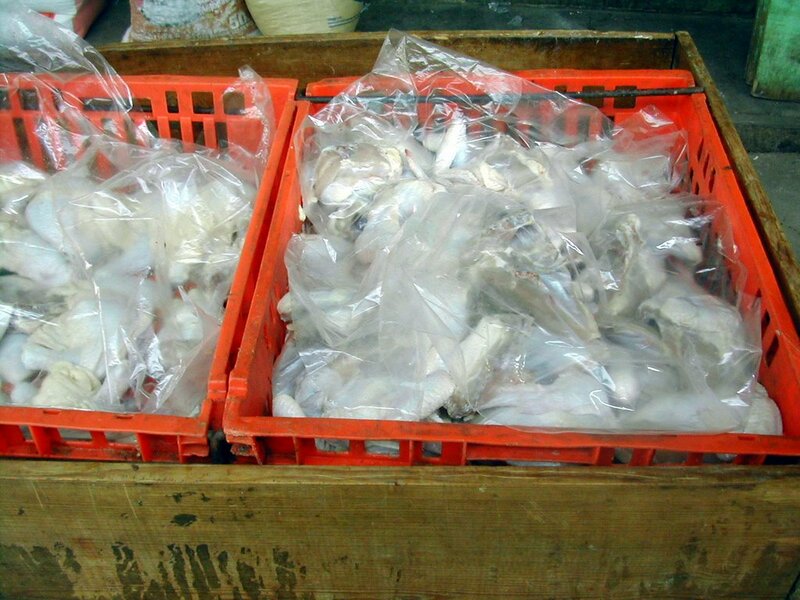 The picture on the right shows unrefrigerated crates of raw chicken pieces. At least these are covered with a piece of plastic, most aren't. This picture shows typical household items sold in markets all over Honduras, very cheap, poor quality items. 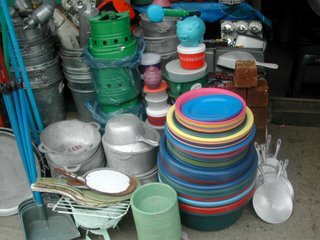 I seriously doubt that the panas (plastic bowls) are made from food-safe plastic, but that is what they are used for. The prices are marked with permanent markers in large numbers inside the soup pots. 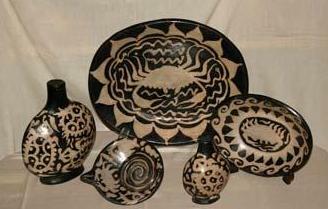 Once I saw a whole display of decorative clay pots that had 4 inch (10 cm.) high "L. 80" permanently marked on the outside of the pots. Sometimes it's hard to figure out what people are thinking when they do things like that. After the great evening with Don Godo and his family, we had an uneventful (good) drive home behind a big truck with no tail lights whatsoever. Luckily it had reflector tape on the back which showed up in our head lights. 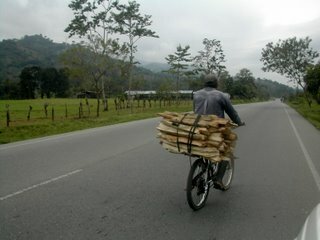 Headlights and tail lights are optional in Honduras. Saturday we took a day trip to Tela. Tela is on the coast, normally about an hour's drive from La Ceiba. 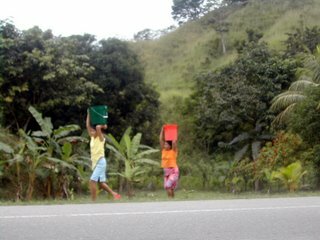 The highway runs east and west and winds around the mountains and passes through miles of pineapple fields, palm tree plantations (grown for palm oil), banana fields, and a few small towns. 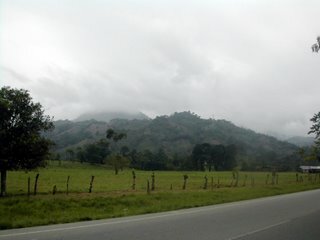 On the south side of the highway, you will see mountains, on the north (sea) side, the terrain is relatively flat. It's a picturesque drive during the day. It can be dangerous at night due to the curving roads, speeding buses, and vehicles driving without lights (many more than you might think). Even during the day, you have to constantly watch out for the trucks and buses passing on blind curves. There wasn't so much traffic this time. We took it slow and actually spent a fair share of time driving backwards after I would yell, "Stop! I want to take a picture of that." The north coast of Honduras has what are called 'cloud forests' versus 'rain forests. This picture shows how the mountains disappear in the clouds. 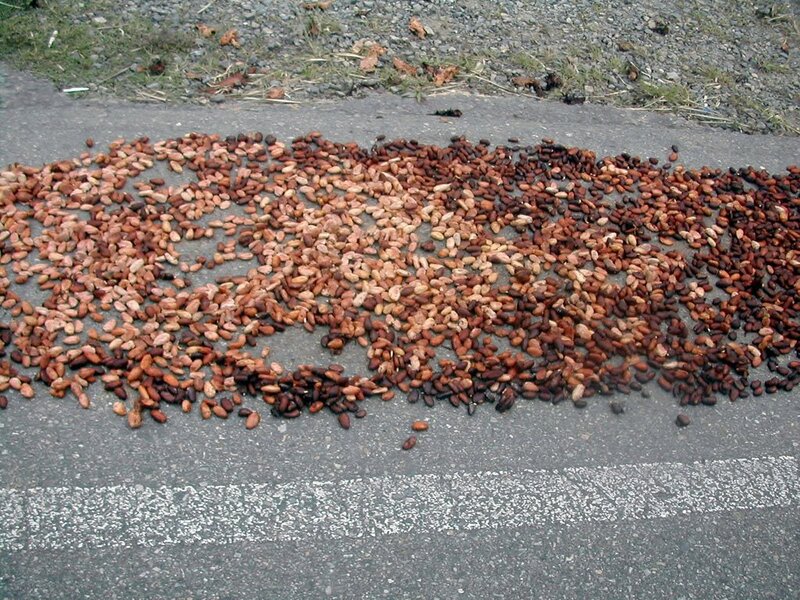 Cacao (cocoa seeds) are often dried on the edge of the highway. 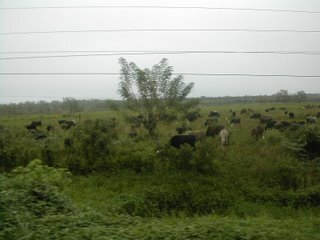 You probably can't see how skinny these cattle are. The cows in Honduras usually have visible ribs and hip bones sticking out. This is a pineapple field. The mountains in the background aren't visible because of the clouds. 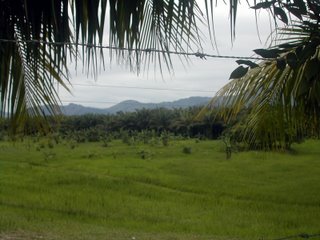 East of La Ceiba, there are miles and miles of pineapple fields. As you get closer to Tela, you see more palm and banana fields along the highway. 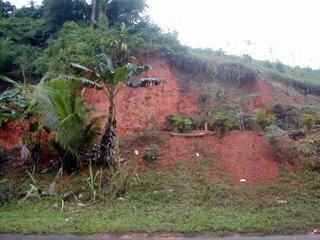 The picture on the right shows our bright orange laterite soil. 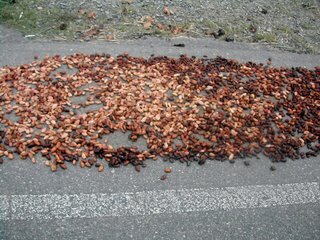 It also shows how the trash is thrown along the roadsides. 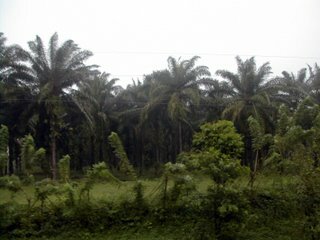 On the left is an African palm plantation. I wanted to show the variety of plants that grow on the palm trunks but it's too dark. The fence posts in front are made of fresh wood − because of the tropical climate, the wood roots and sprouts into trees. Sometimes the trees are allowed to grow, but most often they are hacked back into fence posts with a machete. This is a banana field. The bananas are mulched with something. I can't tell what it is. We mulch ours with spent banana leaves. 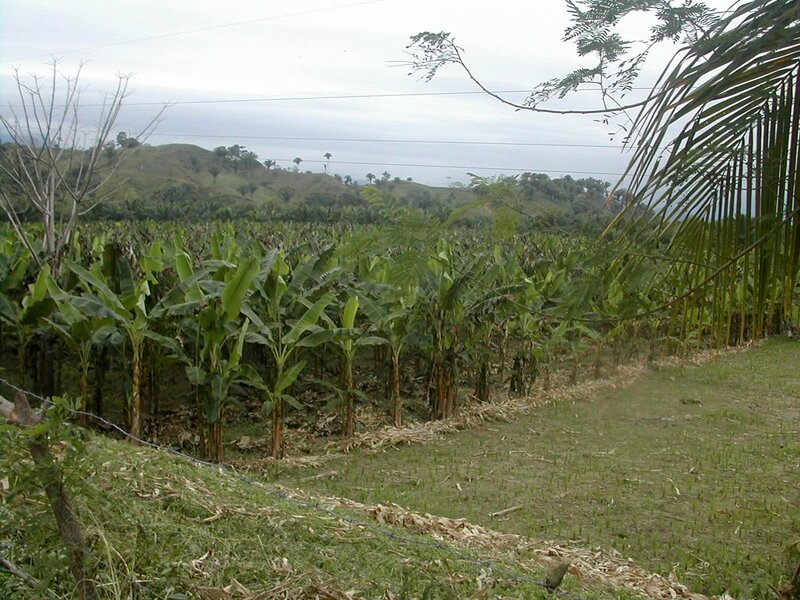 These banana plants appear to have suffered from lack of water before the recent rains. You never know what you'll see on the highway. 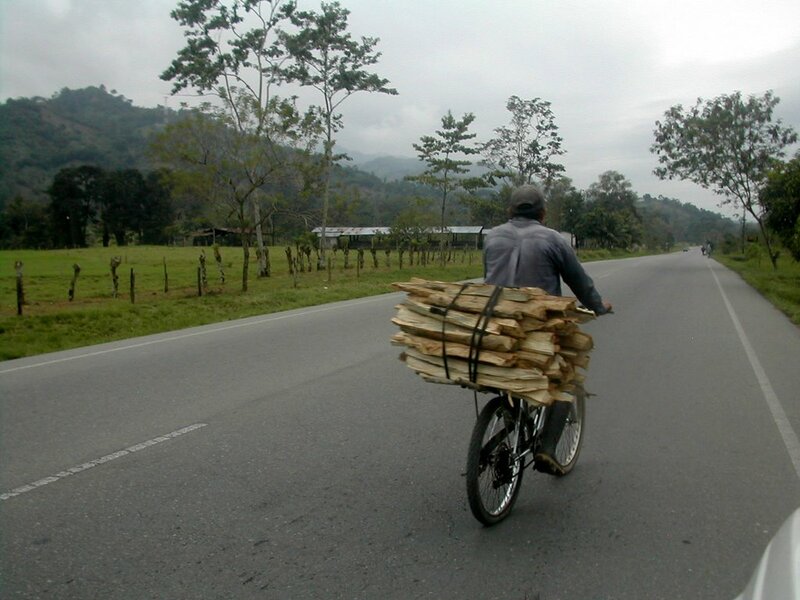 Bicycles are a common form of transportation along the coast. This wood is used for cooking. Many families have only a firepit or homemade stove for cooking. 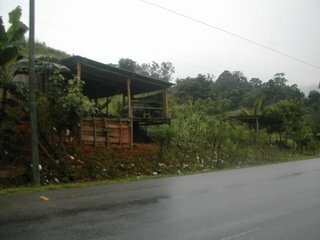 We saw many piles of leña (firewood) for sale along the highway. 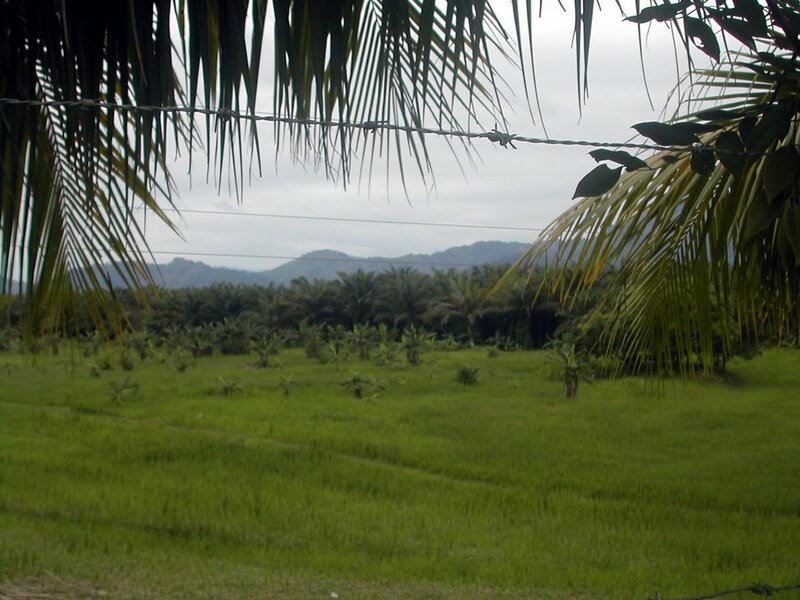 This is another African palm plantation in the distance with the mountains behind. 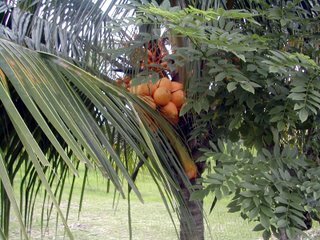 Big clusters of seeds grow on the trunk of the palm trees. They are processed into palm oil for use in this country as well as for exportation. 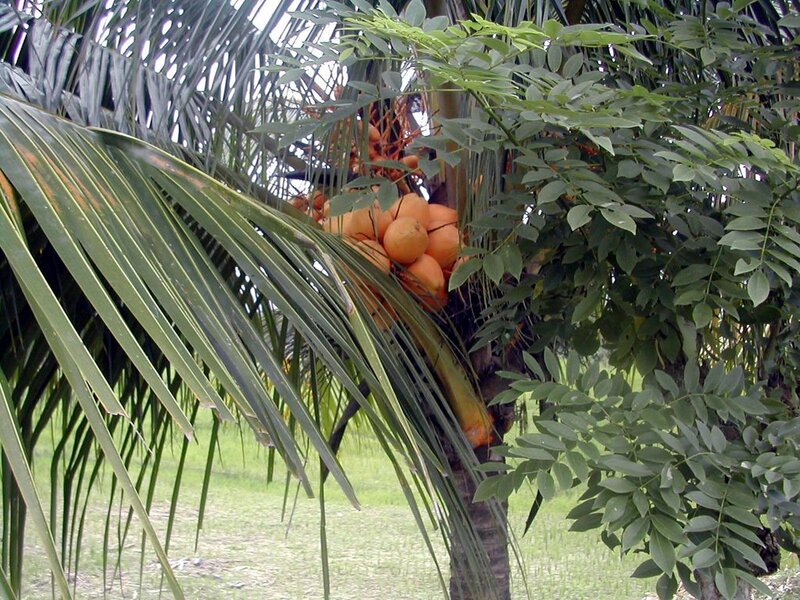 On the left is a closeup of some yellow coconuts. This is a house made out of sticks and clay soil with a roof of palm fronds. The picture includes the obligatory cute barefoot kid in the doorway. She smiled and waved at us. This house has a wood door. I've seen many others that only have a curtain. On the right is a typical small concrete house. If you look closely you can see a white tailless rooster almost the size of the small child. The big palms are coconuts. This house is probably two rooms, a living/cooking area and a bedroom. The door is raised up above ground level so it is likely that this house has a concrete floor, as opposed to the houses in the pictures above and below which no doubt have only dirt floors. 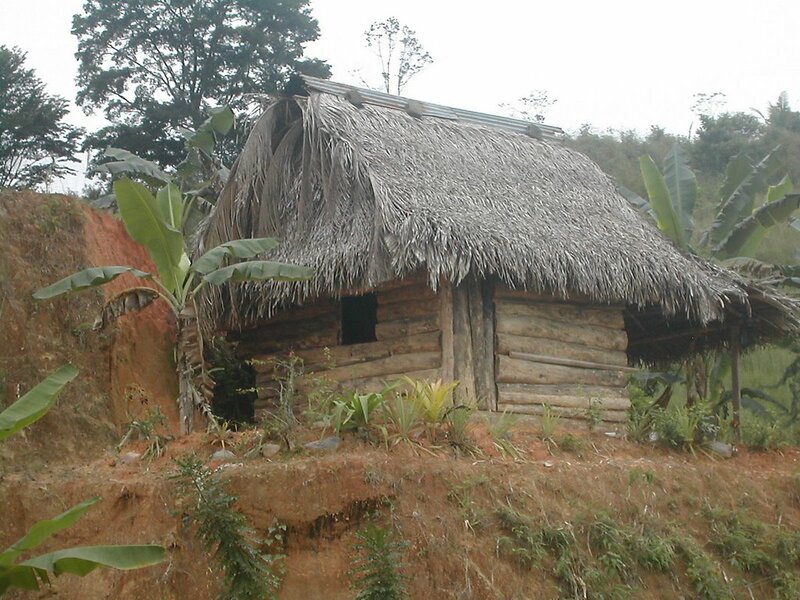 This picture shows a very small wooden house with a palm frond roof. It sits just off the highway on a little cliff that has been dug into the hill. Even though they don't have much space, they are growing bananas and have planted some ornamental plants around the house. This type of house is often built by invasionistas (those who invade the property of others and build a house). Sometimes whole communities are built this way. It's not at all unusual to see houses built of bits of wood, tin, cardboard, and plastic tarps. Depending upon who owns the property (i.e., how influential they are), the police or army may come and knock down all the houses. That happened recently in La Ceiba, where dozens of families were put out of their homes to make way for a new colonia (neighborhood). Tomorrow I'll show you some pictures from Tela, Honduras. Not speaking Spanish very well is a problem. But now I have an even worse problem. Is it possible to forget your own language? Although El Jefe and I speak English together, I find myself forgetting English words! Sometimes I look at a word and I honestly have to stop to think if it is English or Spanish or both. Sometimes I have to put a Spanish word in the Word Reference translator to tell me what the English word is. And I don't mean because I don't know the Spanish word. I do − I just can't remember the word in English. It's plenty scary, especially since my Spanish isn't good enough to take over. This word is an example: tibia. (Yeah, yeah, I know it's a bone in English) It means lukewarm in Spanish and I swear I thought it was the same word in English. I had to look it up to remember that 'tepid' is the word of which I was thinking. I know there are a lot of expatriates out there. Does this happen to anyone else? Or am I having early onset Alzheimer's? I always enjoy seeing how people found my blog since most of my topics don't exactly have a broad audience. The Google searches are especially interesting. I love it when someone comes to my blog and I actually have answered the question they were looking for. Yesterday I saw "How to make tortillas de harina with pictures" −¡cheque! (check!). 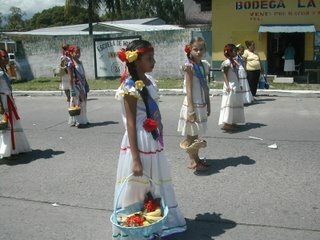 What is the typical dress in Honduras −¡cheque! (check!). Being the insecure blogger that I am, I sometimes assume that if I haven't written about the topic, I should have. Most often, though, I shake my head and think, "Why did Google think La Gringa had that answer?" I just had a laugh from this one and thought I would share it with you: Someone in Japan wanted to know "how many hamburgers in the world?" The blogicito made first page on that for this article, which goes to show you that there isn't a lot of information out there on the total hamburgers in the world. I think McDonald's even quit counting, didn't they? Not much, but colorful, no? 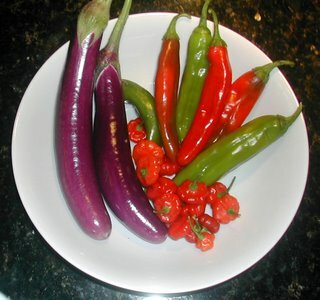 Despite my neglect, I'm still harvesting Ping Tung long eggplant and Anaheim peppers 6 1/2 months after planting. Granted, the eggplants are smaller than I have been getting − only about 7-8 inches (18-20 cm.). The poor plants need fertilizer. I've been too busy blogging to take care of my garden. Those other small peppers are an unknown variety. They have a really weird grassy flavor. I can't even describe it. It's not hot, just weird. I picked them for the chickens but they don't like them either. I didn't plant it. It grew in one of the jardineras (planter boxes) either from seed dropped by a bird or reverted to a parent plant from seed dropped by a hybrid ornamental pepper, pictured below. 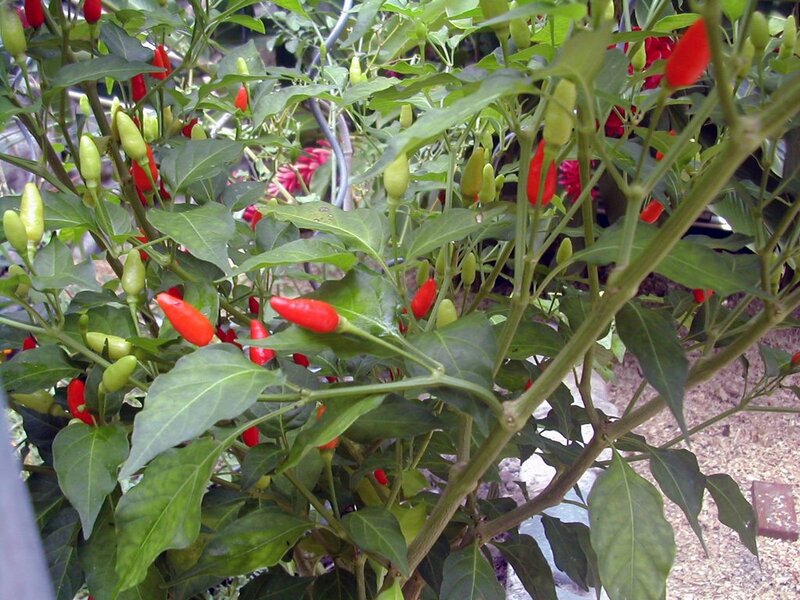 Actually, what I'm calling an ornamental pepper may be a Tabasco pepper, I'm not sure. I tasted it, and even though I like spicy food and hot peppers, this one is way too hot for me. Eeww! 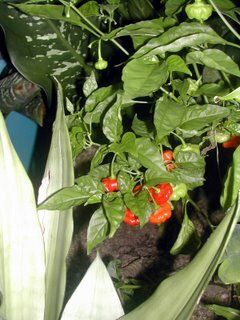 I hate being so inexact about names, but the original pepper plant was given to me by a neighbor, so I really have no idea what I have here. The plants pop up here and there and I leave them because I like the color. 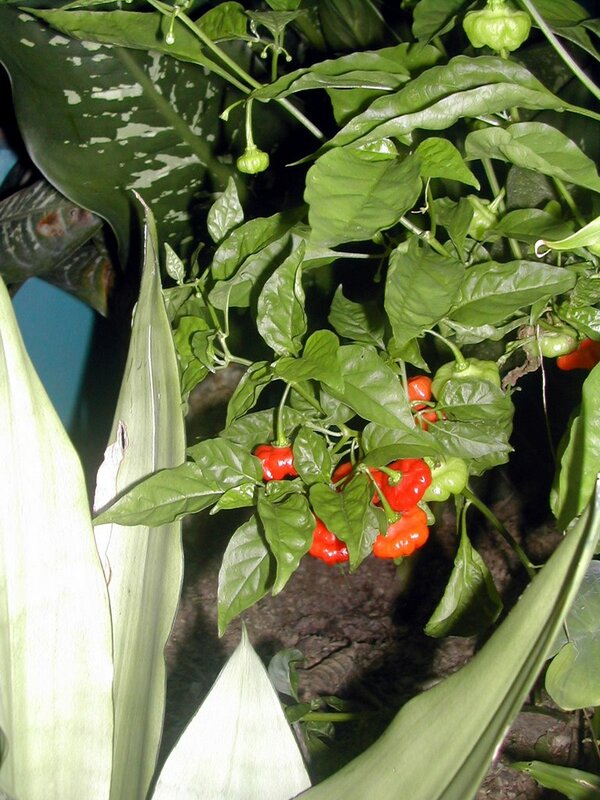 The plants usually have yellow, orange, and red peppers all at the same time. I noticed some nasty, pointy bugs conglomerating on the stems of the anaheim and the eggplants. They were being attended to by some very large black ants. I washed them off with a strong spray of water (I don't use chemicals) but I'll need to check again tomorrow. I want to see just how long these eggplants will produce. So many Hondurans I know revere North American culture from afar. Sorry this is kind of a downer comment, but I can't help but think that Honduras, in its complex, takes on a great deal of negative 'Americanization'. Additionally intriguing to me is the idea that Americans may be actively Americanizing Honduras in certain ethnocentric respects, feeling it's a good thing. I agree about the negative Americanization of the Honduran culture − you just don't see much Honduran culture at all other than the Garifunas, at least where I live in La Ceiba. It is as if Honduras has picked up what is worst about the US and lost what was best about its own culture. It is very sad to me. When I read blogs from Mexico and other Central American cultures, it's wonderful to see the pride in the crafts and clothing and music and dances of the other cultures. I'm not so concerned about Coke and Pepsi, after all they are all over the world, as I am the lack of pride in their heritage. There are pockets of areas, like Valle de los Angeles where lots of crafts are sold or Copan Ruinas where the Mayan ruins are revered − but is it to revere the culture or the tourists? The tourist areas of the Bay Islands are definitely an Americanized tropical paradise, so much so that it seems the habitants hardly believe they are a part of this poor country. Additionally, most of the businesses in the Bay Islands and Copan are owned and run by Europeans or North Americans, so I imagine that what we see is their romanticized version of the culture. Not all but most of the crafts look like 'made in China' cheaply-made, touristy, gaudily painted items or the crafts have been taught to the people by North Americans or Europeans. The very few clay pots that I've been able to find have been plain, lopsided, and poorly made. For every clay pot I find, I could find ten thousand plastic ones, which are considered better by the locals. In the sense that they don't break a month later, I guess they are right. Except for punta music, which is from the black Garifunas, there doesn't seem to be any typical Honduran music. Mostly North American rock or pop, country, reggaeton, and Mexican music is heard. I've asked about Honduran music and no one has been able to tell me anything. The only time I see native costumes is in the parades and many of those seem to be highly fantasized Mardi Gras-like versions. Tight blue jeans or polyester skirts with midriff-showing skimpy tops are the normal fashion here. The only Honduran-made clothes I've seen are the rejects from the foreign-owned maquillas (factories). This picture shows what is considered to be a "typical" Honduran dress, but it has the word Honduras embroidered on the collar and I've never seen anyone wear a dress like this except in a parade. The racism here is reverse also, with the lighter skinned people getting more respect and better service than native darker skinned people. I've heard people complimenting mothers on their lighter skinned babies as if that is somehow better than the darker skinned babies. 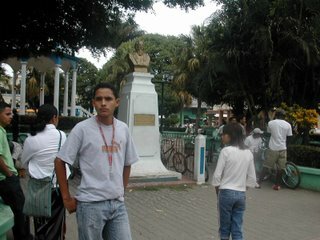 I've mentioned before that everything American is valued and most things Honduran are looked down upon. There are two levels of quality (this is from Hondurans, not me): Calidad de exportación/Americano (export or American quality) or calidad Hondureño (Honduran quality), which everyone accepts will be poor quality. Even if the American items are of the poorest quality (and probably made in China), they will be preferred by those who can afford them. 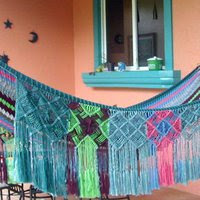 We wanted to build and decorate our home with Honduran materials. After intense shopping for more than a year, we finally had to give up. 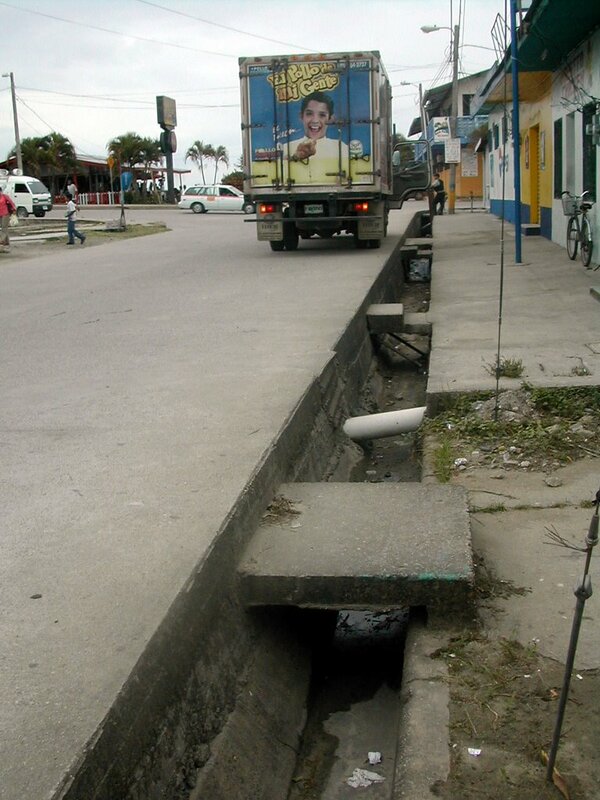 Time and time again we were warned by Hondurans about poor quality and shoddy workmanship. 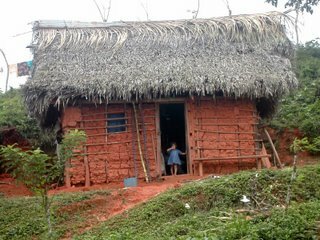 We do have a very expensive Honduran teja (clay tile) roof (against the better judgment of our architect) and after only 3 years, the tiles started crumbling, breaking, and falling off our house. Whether it is a result of poor workmanship or poor installation, I don't know. I do know that there are houses 50 - 100 years old with teja roofs that don't have this problem. This Americanization is something that I've thought about a lot and I certainly don't feel I am expert enough to analyze the reasons for it. I do wonder how much the influx of the European and American banana companies in the early 1900's had to do with it. I'm sure at that time, modernization was revered more than preserving the heritage. And I'm sure they brought their share of racism with them since that was a way of life at the time. Dole's Honduran headquarters are here in La Ceiba so this town may reflect more Americanization than others. There are a few ways that I wish Honduran culture would change. I wish people would take pride in their workmanship. I wish people would stand up for what is right and demand better treatment from others, from businesses, from their government. I wish people would treat each other a little better. I wish people would value honor and not cheat and steal from everyone else, the rich as well as the poor. When I came to Honduras, many people told me not to trust anyone. We didn't believe it and we paid the price several times, sometimes even from people who we thought were friends or from people we were trying to help. I'd like to hear more about how "Americans may be actively Americanizing Honduras in certain ethnocentric respects," so, David, if you write about it, please let us know. Or feel free to leave another comment. Oh boy, if you thought your comment was a downer, how about this article! I'm depressed now.